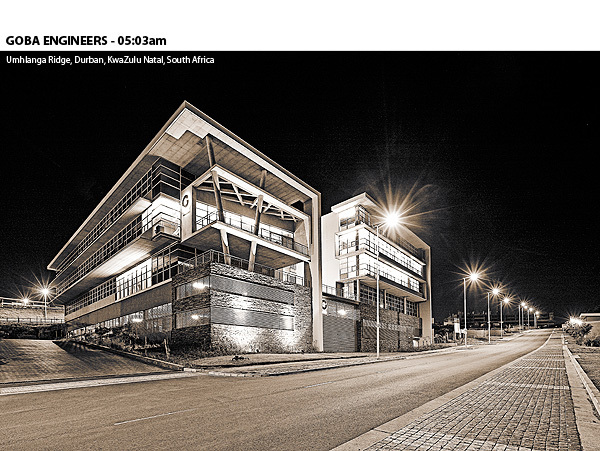 The difference that 35 minutes of changing light can make to an image can be quite substantial… as these two shots below of the GOBA Engineers new office building in Umhlanga, Durban, which were captured yesterday morning at first light show. I was up early and on site by 04:30am getting set up and waiting for the first light of day to break having chased these specific two images for the last three weeks or so for a commission I’ve been working on. The weather has been all over the place here lately with a tropical storm that’s been blowing through and didn’t seem to want to clear so getting some rather ‘ordinary-looking’ clear sky shots of this building for the design architects at Elphick Proome has proven rather more challenging than one might have expected. 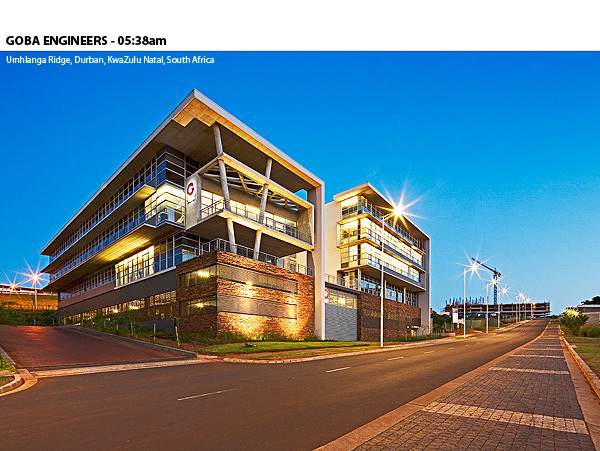 Sunrise in Durban on Saturday was at 06:03am with the first light of day (known as ‘Nautical Twilight’) breaking across the sky at 05:11am – Nautical twilight is defined as the period of time when the sun lies between 12 and 6 degrees below the horizon. It’s from this time that the blackness of the night sky starts to give way to the light of day and is the brief few minutes when objects on the horizon start to take shape against the lightening sky before the period of ‘civil twilight’ begins (when the sun is between 6 degrees below the horizon and square on the actual horizon). It’s in this period of rapidly changing light that you always capture the most beautiful images of buildings, seascapes and landscapes. I’m certainly not an early morning person and it always takes a thousand wild horses and a flask of strong coffee to get me out of bed in the morning. The images however are always worth the effort and it’s actually quite a nice time of the day to be up and about once you get going and have had all that coffee. Love this Dennis. Great comparison.